Sure, Florence has world-famous art museums housing Renaissance masterpieces, medieval churches, incredible shopping and plenty of amazing restaurants, but to truly understand Tuscany, you’ve got to get out of the capital and explore the countryside. Many villages are accessible by regional trains, but for the most autonomy, rent a car and map out a road trip through the region’s rolling hills, stopping in these picturesque towns in Tuscany along the way. 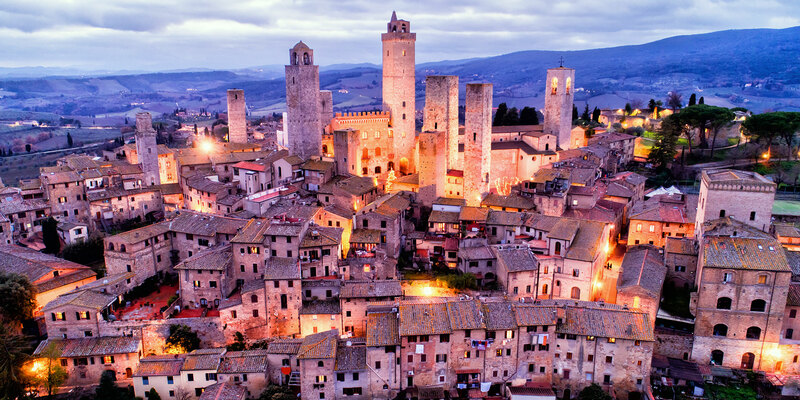 Pisa may be more famous for its leaning tower, but San Gimignano is known throughout Italy for its incredible collection of medieval towers. Out of the 72 towers that once existed, there are 14 still intact, and they create a skyline of medieval skyscrapers. Wandering through the city center—a UNESCO World Heritage site—feels like stepping back in time. After all, it’s one of the best preserved medieval towns in all of Italy. Thirty miles south of Florence, the medieval city of Siena is a charming maze of narrow streets that all seem to lead to Piazza del Campo, the picturesque main square.